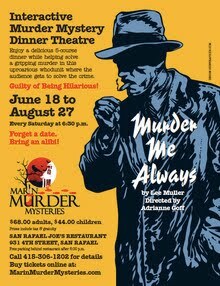 Marin Murder Mysteries is presenting "Murder Me Always" every Saturday at 6:30pm -June 18th through August 27th at San Rafael Joe’s in San Rafael, CA. but best of all a portion of all ticket sales goes to fund acting scholarships for children in Marin. The production is directed by Adrianne Goff.